Hotel Galvez & Spa®, A Wyndham Grand® Hotel, invites Galveston area couples and visitors to renew their commitment to each other during its annual Galvez Wedding Vow Renewal on Saturday, June 7. 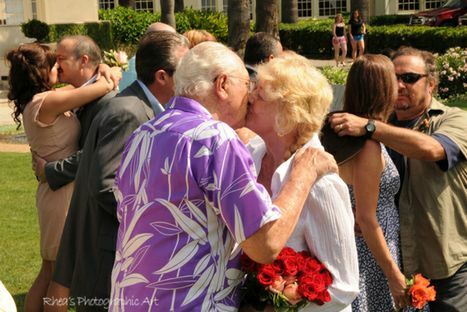 In 2013, more than 20 couples renewed their vows including area couples Yolanda and Manuel Corella, who celebrated 63 years and Rodney and Ann Reeves, celebrating a momentous 56 years. In a romantic twist, the General Manager, Steve Cunningham, shared in the celebration by re-committing to his wife of 28 years, Becky Cunningham. The 10 a.m. ceremony, held on hotel grounds, is officiated by Justice of the Peace Jim Schweitzer. Following the ceremony, the hotel hosts a small reception for participating couples. Couples also receive a courtesy bouquet and boutonniere for the ceremony and professional photos are available for purchase. Hotel Galvez & Spa®, A Wyndham Grand® Hotel and National Trust Historic Hotel of America, is the only historic beach front hotel on the Texas Gulf Coast. This 224-room, century-old hotel offers 13,000 square feet of meeting space, a 9,763-square-foot spa, fitness center, full-service restaurant, lobby bar, pool with a swim-up bar and Hall of History. 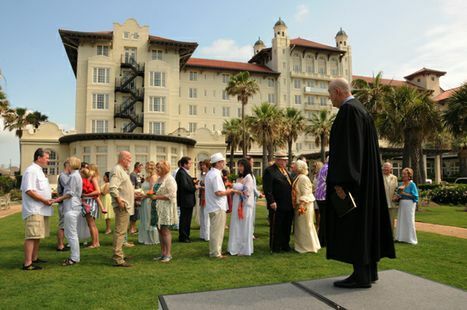 Justice of the Peace Jim Schweitzer officiates the 2013 Galvez Vow Renewal. The 2014 ceremony is scheduled on Saturday, June 7. Photo by Rhea's Photographic Art.